Yesterday, I cleared my calendar for the long-awaited delivery of a new dishwasher. Arriving early so I wouldn’t miss the delivery hours, I imagined having a dishwasher that would work well, with a black face to match all the other appliances. The sales person in the store spent a lot of time with us, choosing just the right model and color, and seemed quite proficient in executing the order. The delivery men removed the old, nonfunctional dishwasher and brought in the new one. Unfortunately, it had a bright, white face. Definitely not what we ordered. What ensued was a series of phone calls to the central calling center of the company. You know how that goes. “Push one if…” 25 minutes later, I was speaking with Denise, a real human being, who spent another five minutes finding, and then reading off the order – which I had in my hands. Then she tried to match the numbers on the order to the model, which the delivery man had already done. Clearly, she had no idea what to do about the situation, but didn’t know how to say that. I suggested that if she couldn’t help, perhaps I could speak with her supervisor. While I waited for her to find out how to connect me, I mentioned that, when a company has made an error, the customer appreciates an apology. In my medical career, I have run late many times. For several years, I was so over-booked that my patients were genuinely surprised when they were called in to the exam room on time. One patient became somewhat annoyed when we ran on time, as she said: “When I come here, I look forward to having some time to read the magazines in your waiting room!” Other patients were clearly angry, and several expressed, “My time is just as important as your time.” Early in my career, assuming my patients knew I was working as hard as I could, I felt they didn’t need an apology. It wasn’t that I was slacking off or wasting time – I was taking good care of people and that is why I ran late. They, too, would get all the time they needed. Nowadays, I always apologize when I enter an exam room after the patient has waited. It is a simple, heartfelt sentence that creates partnership and rapport, and puts us on a path together toward understanding and solving their problem. 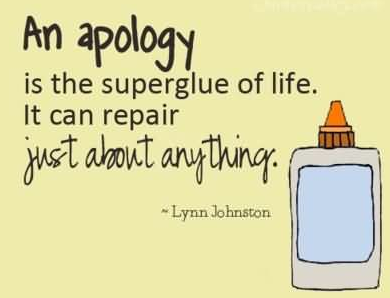 When I suggested to Denise that an apology might be appreciated, she enthusiastically said, “I’m really sorry!” I definitely felt better. This entry was posted in building relationship with patients, effective communication in healthcare, first impressions, honesty in medical care, physician coach, physician coaching, physician communication and tagged Building relationship with patients, communication in healthcare, leadership, medical career, patient satisfaction scores, physician coach, Physician coaching, relationships, success. Bookmark the permalink. Helane, what a wonderful anecdote. I will be sure to pass this along to those who “need” this reminder. I think that many of us could use this reminder! I know that I can get caught up in all that I have to do and can see only my own schedule and demands. It actually helps to bring myself back to the realization of who holds the ultimate power in my life – me – when I acknowledge that I allowed myself to be late, didn’t consider another’s needs, or otherwise let someone down. Maybe I over scheduled myself, chose to spend more time with my last patient, or didn’t manage my time well. For me, when I accept the responsibility for whatever happened, it gives me the opportunity to ask, “what do I wish I had done differently?” And then to see the possibilities to enact the changes that will allow me to live in a way that reflects my true intent, to show respect to other people and create relationship.